Braintree, MA (August 29, 2016) – More than 50 volunteers, staff and residents of Braintree Village – a 324-unit apartment community managed by full-service real estate firm Peabody Properties, Inc. – recently celebrated the annual Building Bridges Youth Basketball League with representatives of the Braintree Police Department and the local community. Now in its eighth year, the Building Bridges Youth Basketball League – a six-week, interactive program at Braintree Village funded through a MassHousing Youth Resident Activities Program grant and supported by the Braintree Police Department– has provided children and teens, with an opportunity to improve their basketball skills through weekly practices and games. Equally important, through this initiative, young residents work closely with a team of adult volunteers who become mentors and role models, helping the youngsters develop leadership and communications skills, build their self-esteem, and learn to respect themselves and others. During the celebration, youth program participants and volunteer coaches, John Sealey and Kaeleen Price, were presented with citations from Mayor Joseph Sullivan for their involvement in the league. Additionally, parents of participants were recognized by Peabody Properties’ Resident Services department for their commitment and dedication to the program. According to Lynne Sales, Director of Resident Services at Peabody Properties, the basketball league at Braintree Village provides an opportunity for residents ages five through seventeen to take part in a sport they love while learning skills from well-respected community members. “It’s a privilege to partner with the Braintree Police Department on such a life-changing program for our young residents. We look forward to continuing this program and are committed to building on this collaboration with the Braintree community,” said Sales. 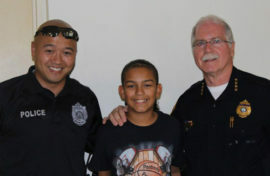 Pictured above (left to right): Braintree Police Officer Edward Wu, Braintree Village resident Joelanier Baez, 11, and Braintree Chief of Police Russell Jenkins.